There are many factors that come into play when deciding if a picture will be a strong black and white image. Photos with strong contrast - the difference in brightness between the darkest darks and lightest whites and all the shades in between - can make compelling black and white pictures. Also converting an image with shadows or texture to black and white can add dramatic and moody effect. Also taking away the colour from a photograph can sometimes help to simply the image and minimize distractions (I've used this trick many times when my house is a bit of mess!). But it's not always so black and white. Sometimes a photograph looks amazing in both colour and black and white, so it can be hard to decide which one is best. And "best" is often subjective anyways. The good news is that with all my photography sessions you don't have to decide. I provide my clients both the colour and a black and white versions of each image. I love the diversity that this provides. My photography style is generally bright and airy but by converting to black and white, I'm able to give a totally different feel to the exact same photo. Often a black and white photo conveys more of a moody, emotional and raw feel to the photograph. 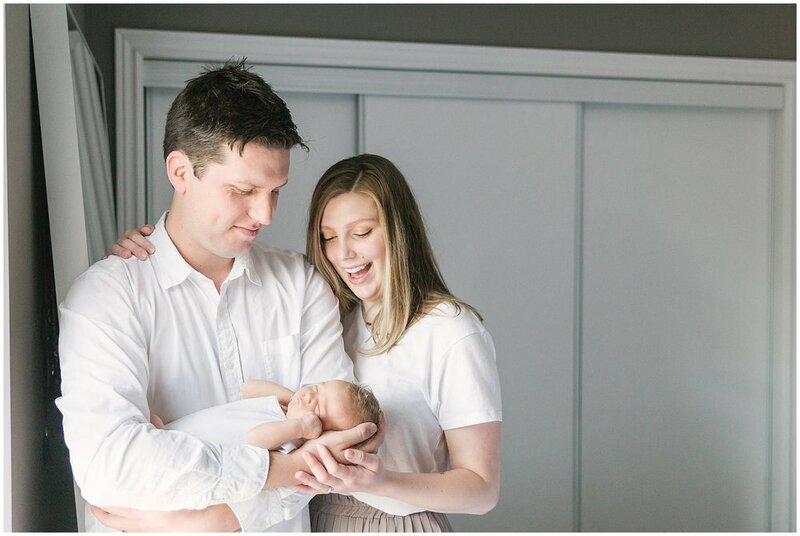 Here are some favourites from an in-home newborn portait session in the east end of Toronto. So you can decide which do you prefer: Colour or black & white? 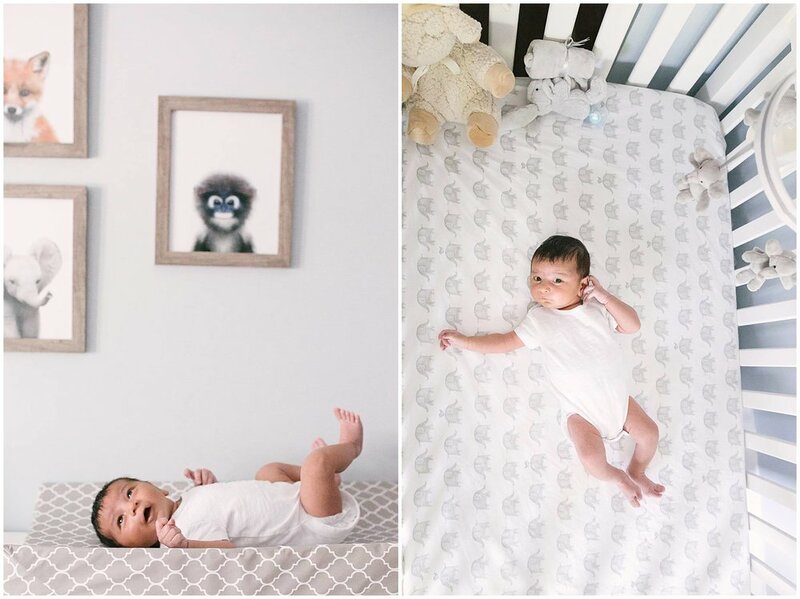 Toronto newborn photography: at home vs. in a studio? When you're searching for a newborn photographer there are tonnes of options out there. One question to consider is: an in-home session vs. in a studio? What is the best newborn photography style? The truth is, there is no right answer. Each style has it's unique benefits, and thankfully there are many talented photographers in Toronto and the GTA who specialize in these genres. Studio newborn photography takes place in you guessed it, a studio. The studio lighting is controlled and backdrops are neutral. All the supplies needed for the shoot are on hand and your photographer will usually keep the studio warm to encourage sleeping babies. On the other hand, in-home or lifestyle newborn photography takes place in the comfort of your home. Your house is an important part of your family's story and will be featured in your lifestyle session! 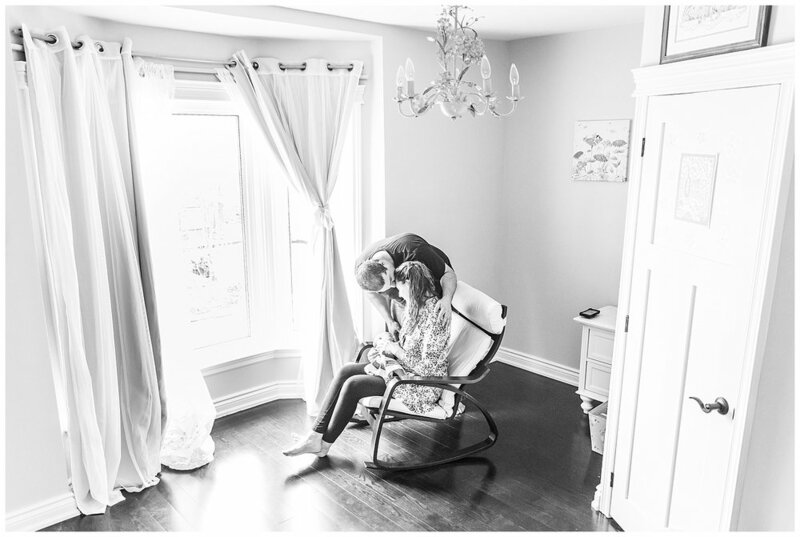 Your photographer will shoot in the rooms with the best natural light, such as the nursery, master bedroom and living room. Images will capture the small details that make your home yours. Favourite shots might include the new family snuggling together on the bed, the baby sleeping in the crib and mama siting in a nursery chair looking adoringly at her new baby. Timing is critical for posed, studio portraits: most photographers prefer to photograph newborns at less than 2 weeks of age. 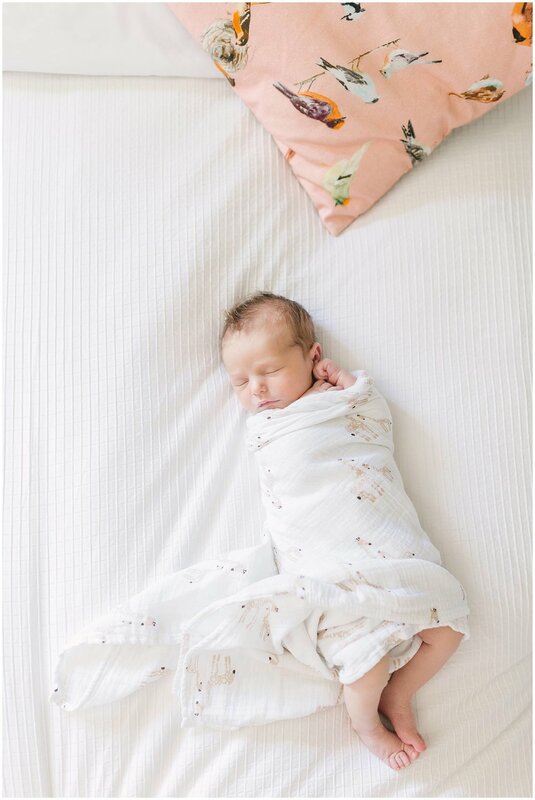 Younger newborns are more likely to fall into deep sleeps necessary for the poses, and are more flexible to curl up into the desired positions. Lifestyle newborn sessions have more flexibility when it comes to timing. Babies change so fast, so I tell my clients that it can be nice to capture them at this unique stage when they are only a couple weeks old. 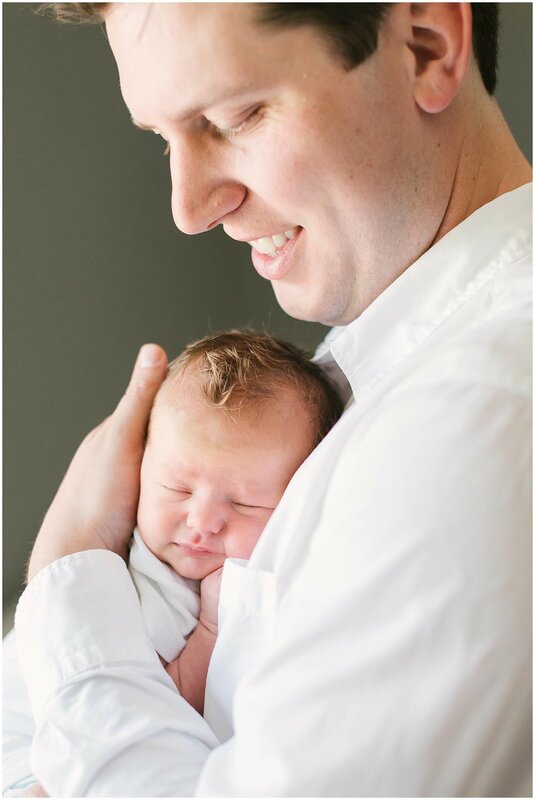 However, lifestyle newborn sessions with older newborns have some advantages: it gives parents more time to adjust to life before stepping in front of the camera and babies who are little older make better eye contact when awake. 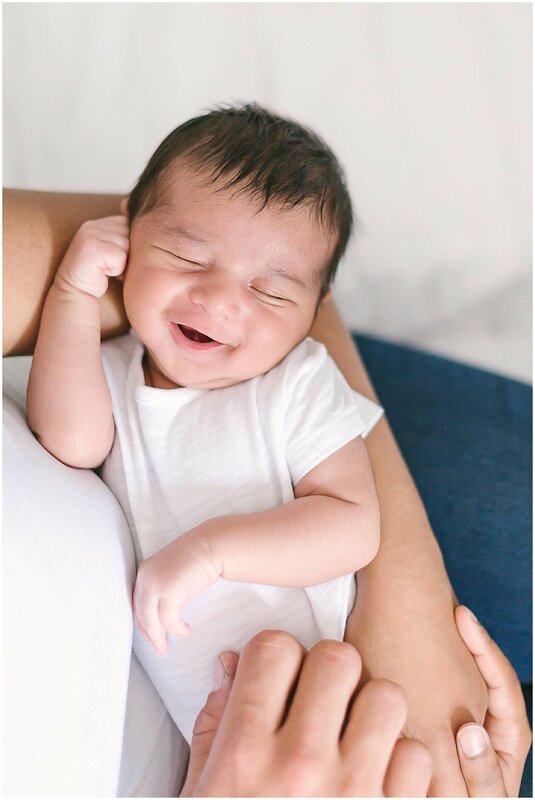 Studio newborn photography features posed newborn and family shots, with adorable babies curled up in womblike poses (or propped up on hands, etc.). It often includes props, such as baskets, headbands, coloured wraps, etc. 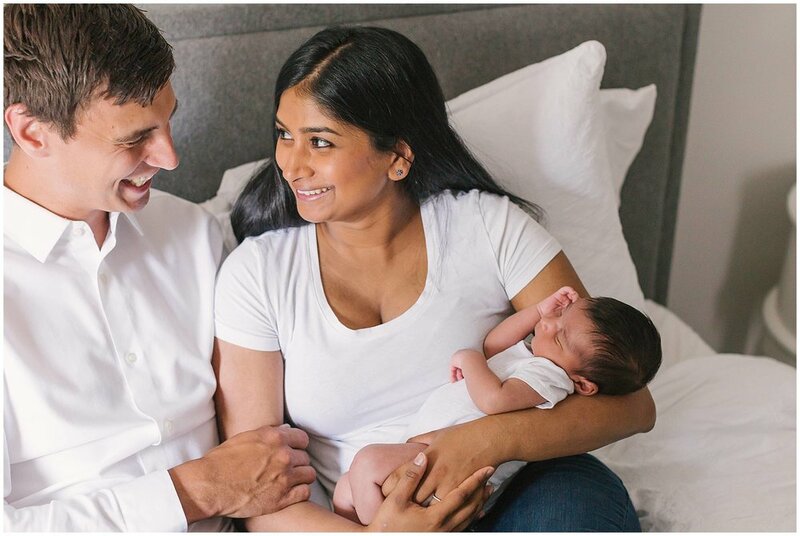 Lifestyle newborn photography focuses more on the interaction between the new family, with less importance placed on the perfect pose. It is typically more candid in nature, although your photographer will likely guide you and provide suggestions on how to get a natural look. Instead of using props, lifestyle newborn photography typically includes items you already have in your home, such as a favourite blanket or the child's nursery as the background. Hopefully now that you know some of the key differences you can decide for yourself what is the best choice for your family. My style of photography is lifestyle: I love to focus on connection and photograph the intimate environment of my client's home. Here are a couple of my favourite shots from a recent newborn shoot. I met the adorable little Nora just a couple weeks ago. She was such a dream baby and her parents did great job too (they were so natural in front of the camera). So it was a bit of a suprise afterwards to receive a message from the mom thanking me and saying that they don't usually enjoy having their picture taken but that the session felt relaxed and they didn't feel awkward at all! Because let's face it - getting your photo taken can sometimes feel unnatural. I sometimes forget that fact since I'm the one usually taking the picture. Just today my husband took a picture of me. So many thoughts were racing through my head "Does this look natural"?, "What should I do with my hands?" and "Does this smile look fake?". But in the end getting your photo taken doesn't have to be a stressful experience, and is so worth it. Time moves quickly, so it's so nice to have photos to look back on and remember your life in different phases. With my approach to photography, for most of the session you'll be interacting with your family, laughing and having fun. The goal is really to make you not aware of the camera at all! Here are a couple of my favourites from the session. When is the best age to take newborn photos? I’m often asked about the best time to take newborn photographs. The short answer is "it depends”. For some types of newborn photography, such as posed portrait sessions like this, taking pictures 5-10 days after birth is highly encouraged. At this age, newborns are more likely to stay asleep and curl up into "womblike" poses. But since my newborn style is more natural and lifestyle in approach, there's more flexibility in terms of timing. I take a combination of documentary/true-to-life shots along with some "baby-led" poses (e.g. arms outstretched and yawning, or baby swaddled in a favourite blanket in mom's arms). While it can be helpful to have the baby sleep for the session, it's not something I stress about, nor is it critical to the session's success. 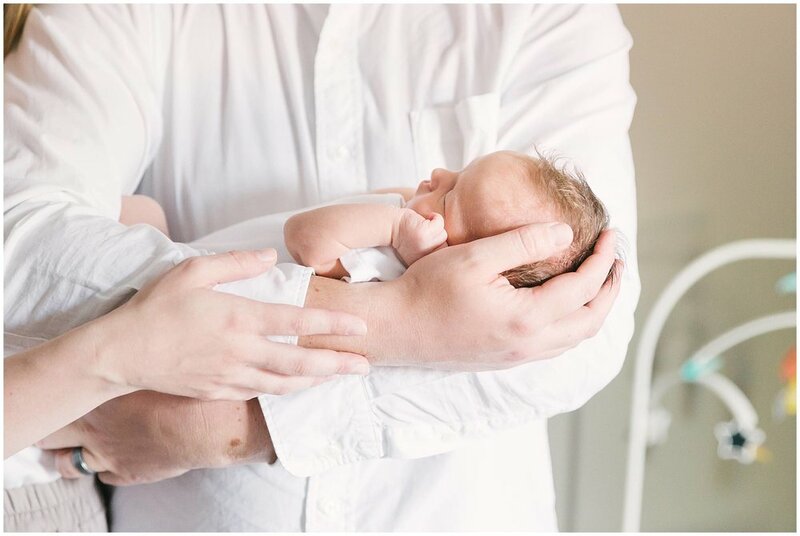 So all things being equal, I will usually suggest that clients take newborn photos within the first two weeks of life when the baby is at its tiniest and newest. Babies change so fast, so it can be nice to capture them at this unique stage. But I'm also more than happy to schedule older newborn sessions. In fact, there can be some advantages to waiting: it gives mom and dad a little more time to adjust to the craziness of new parent life before getting in front of a camera, plus older newborns are often more likely to make eye contact. 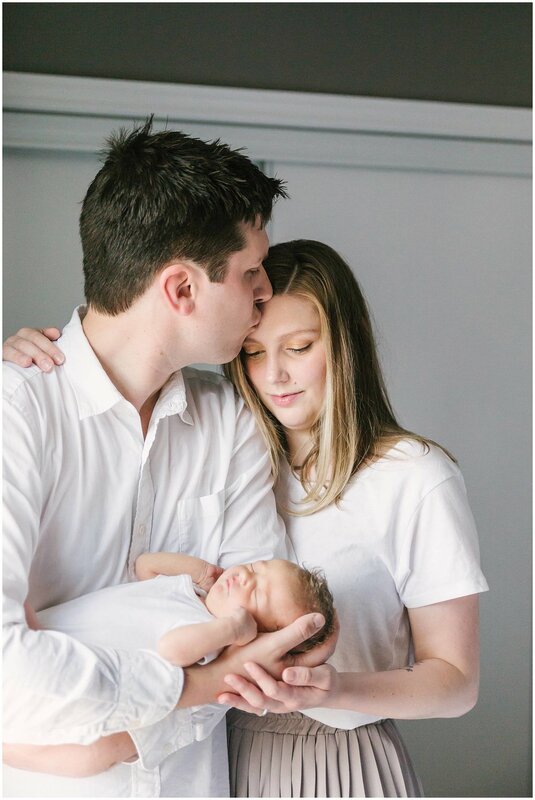 Here are pictures from two newborn sessions: one with a younger newborn and other with an older newborn. I have a confession - I always thought that I wanted three kids. But now that I've become a mom, I'm starting to think that I might only be cut out for two! So I'm pretty impressed (and slightly envious) of those families who are able to have three kids and keep it all together. Last weekend I had the opportunity to photograph a family with three adorable little girls. Newborn Parker was a dream baby and slept through most of the session, while her two older sisters provided lots of high-energy entertainment (along with some affectionate moments too). 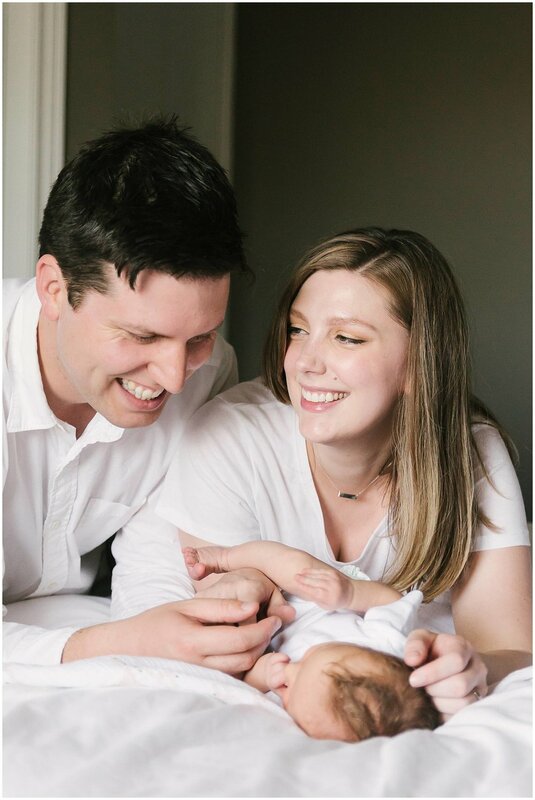 And their parents were unbelievably relaxed, especially considering they had just completed a home reno days before Parker's arrival. Here are some of my favourite shots - enjoy!